We all wanted our story in Hogwarts. Now it's my turn. Here I am. We arrived all together and after crossing the lake with a big man called Hagrid, we had to stay on the hall of a big castle. We all were visibly impressioned. I stook next to Sarah and Drown, even if he hadn't stopped reading his strange magic book. Then, a teacher told us that we could get into a room. It was big. VERY BIG. Impressionant. I stopped and another boy shoved me. A hat started to speak - TO SPEAK- and then the same teacher, who introduced herself as Minerva McGonagall, started to say names. Boys and girls in my age started to sit down and the hat sended them to a house or to another. Suddenly, she said my name. I looked at Sarah and Drown -I looked at Drowns book, which was in front of his face.-. I closed my eyes. The hat started to think. I felt like all my feelings and thoughts were being checked by it. I smiled and jumped off the chair to run to my new house's table. Everybody thought Hufflepuff wasn't the best house. For me it was, and actually it is. Drown ended up in Slytherin. He didn't pay atention to anyone in his new house, he just continued reading. Why was he so weird? I thought Sarah would end up in Gryffindor, cause she was like so open-minded, but she didn't. She was in Ravenclaw. Maybe, there I should try to spend more time with my new "friends". Cause...We were friends, weren't we? The BIG DAY was near, so near...The first of December, I woke up at 5 o'clock in the morning. I couldn't sleep more, so I reviewed all the things I had to take with me. My wand, a perfect and beautiful owl called Pimey, my clothes, books... My parents bought me a white peacok quill, as a present. The moment of saying goodbye to my parents was difficult, but they didn't cry. They hugged me and I went into the train. I searched a compartiment. Higher boys and girls punched me from one side to another, and I got into a half-free one. -Hey...-Said I, smiling at a black-haired boy with green eyes.-Can I sit here, please?-Asked I. The boy didn't say anything. He maked a gest that should mean "Yeah, sit down" and he started reading a Potions-book. I ate my sandwich while I read "Hogwarts History". Another girl came into the compartiment. -Hello.-Said she, looking at both of us. She wasn't tall, but a little bit more than me, and she had black eyes and dark-brown, straight and long hair. She went into and sat down in front of me. She looked again at us. I nodded and the other boy did too. I closed the book carefully and looked at the girl. -My name's Miranda.-Said I.-And yours?-Asked I to the misterious boy. He didn't say anything else. He was strange, but I thing all of us are a little bit strange. We changed our muggle-clothes for a tunic and the train stopped. The biggest day of my life was starting jet. I was amazed! I wanted to run to see everything, but my parents told me to stay next to them and go first to buy the books. I remember the smell of that beautiful shop, full of books. Some of them were normal ones, others were magic, they spoke at me or maked strange noises. We bought books, clothes, a pretty, little owl who I called Pimey (Darkness, because it is black with blue eyes ^^). And we went to buy a Wand, in a shop called Olivanders, but I knew the real owner was dead...So another person was working there. It was very, very difficult to find an apropiate wand for me. But we found one. Or, better said, it found me. It was 18 cm long, weeping willow wood and nucleus of unicorn hair. It was flexible, beautiful... I cannot discribe what I felt when it chose me. I woke up the day of my eleventh birthday. I was excited, that way kids are. I stood up and I looked around, but I didn't see anything. There weren't any presents, 'cause it was only 7 o'clock in the morning, Saturday morning, so I opened my rooms door and I went to the kitchen. I turned up the lights and, suddenly, I saw something moving and making noises over the table. I screamed, so mi dads woke up and run to the kitchen. They arrived to the kitchen. My mum and my dad were in pijama, but my dad was holding a hokey stick. 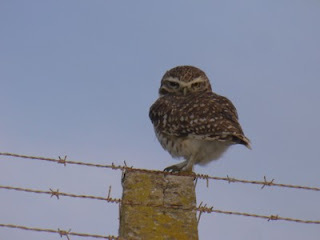 It was a very funny scence, because the "thief" was a light brown owl, that looked at us wide-eyed. I laughed before I saw it was taking a letter in its claws. -What's that?- Asked I, to nobody special. I walked to the owl, who didn't move. I took the letter. "Miranda Waldorf, Street...."
I opened it and started to read. At first, I didn't understand anything. I turned around to look at my parents. -Is this right, dad? Mum? Am I...A witch? -Asked I-You told me grandpa was inventing that story about Hogwarts and Harry Potter and so on. Was it? Was it a story? My dad looked at my mum. Then they looked at me, and made me sit down. They did the same. 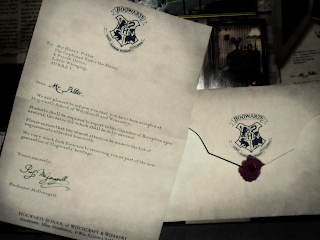 I re-read the letter, smiling. My parents were discussing of letting me go or not. -Ok, she can go...-Mum gave up. She stood up to prepare hot chocolate, and I run to hug her. Do you like the story?